I find this study fascinating. Since I’m a combination of left and right, I won’t consider myself totally boring. Just mostly boring. And it’s what draws me back again and again to writing such as this. Please don’t skip this one. I would love to know how you assess yourself…left or right. Well, it’s a little like spiritual warfare….the left brain says, “must make dinner, pay bills, take out garbage, vacuum, do laundry, fill in the blank ad nauseum” and the right brain whines and says, “gee whiz, do I haffta, can’t I just knit/sew/quilt/read?” Right brain says, “NO, must be a responsible adult. Then left brain hubby comes home, plops down on the couch and proceeds to do sudoku for hours with never a thought to needed chores…go figure! I need some time to figure this out. Hey, what was that shiny thing? SO INTERESTING!!! First of all, my left brain helped me find your blog which I have been reading and enjoying for about 3 years. I would never classify you as boring ever! I have been married a very long time and have always just thought that my husband and I had male/female differences in thinking and perspective. 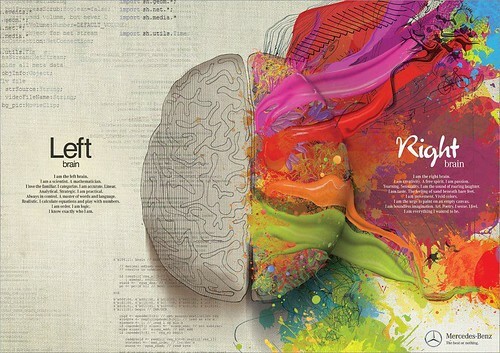 Now I am enlightened (better late than never) to the left/right brain dynamic. Thanks for opening this world to me, because now I know that between my husband and I we have one really good brain! Thanks also for the new blog to add to my favorites…….she is awesome!!! When I was young I tend to be both but when I started to immerse myself with arts especially writing, my right brain just shut the left brain off. Sometimes I find it hard to focus on things that requires my left brain 😀 Nice visual comparison though.